Thousands of visitors come to Gatlinburg every year to experience the beauty of the Smoky Mountains and enjoy fun-filled attractions nearby. Many visitors look for a Gatlinburg cabin in the heart of all the action, while others look for accommodations off the beaten path. Cabin rentals in the Glades area in Gatlinburg, TN are an excellent choice for guests looking for a unique Smoky Mountain experience. These log cabins just off of highway 321 near the Greenbrier area of the national park feature a less crowded part of the Smokies and are some of our more private cabins in the mountains. Discover why the cabin rentals on Glades road in Gatlinburg, TN are an excellent way to take the path less traveled! There are many reasons guests choose cabins near Glades Road for their Gatlinburg vacation. First, this area is home to the largest arts and crafts community in the United States! This historic community has attracted artists and artisans from across the country to work and perfect their craft. As a result, there are dozens of unique shops featuring quality, handmade goods that can be found no where else. Since this beautiful part of the Smokies features peaceful country roads and scenic covered bridges, it is no wonder why artists flock here to live and work. A visit to the Glades can be spent simply marveling at the beautiful arts and craftsmanship required to make these goods. Next, there are many unique eateries in this part of Gatlinburg that feature every thing from down-home country cooking to trendy culinary experimentation. Also, though the these two or three bedroom cabin rentals on Glades road offer guests a more secluded cabin experience, they enjoy a location only a 5-10 minute drive on Hwy 321 from downtown Gatlinburg! Here, vacationers to the Smokies will find two famous entrances to the Great Smoky Mountains National Park! Guests staying in the Glades will also have the advantage of being closer to the Greenbrier region of the park that is something of a hidden gem. Some favorite nearby features are Ramsey Cascades and the Porters Creek Trail. These luxury features in your Glades cabin rental near Gatlinburg are sure to make your stay in the Smokies a relaxing and memorable occasion. These cabin rentals are also popular honeymoon cabins thanks to their relaxing amenities, peaceful location and stunning Smoky Mountain views. Whether you are looking for family fun, a unique Smoky Mountain experience, or a romantic retreat, these cabin rentals are ideal for enjoying the best that the Smokies can offer! Once you find the perfect cabin to suit your vacation needs, remember that you will save 15% with our discount. All online bookings receive this special deal so you can begin your stay in the Smokies with great vacation savings! Enjoy a secluded cabin that's only 10 miles from Dollywood Theme Park and Gatlinburg on your Smoky Mountain vacation. Book & save with our 15% discount! Experience luxury and gorgeous views in the Smokies when you reserve "Angel's Landing," a 2 bedroom Gatlinburg cabin that sleeps 6 guests. I Love View is a luxurious 2 bedroom Glades Gatlinburg cabin rental with home theater. Enjoy fantastic views of the Tennessee Smoky Mountains. Oakland No2 is a secluded cabin near the Gatlinburg Glades Arts & Crafts Community with hot tub, fireplace, jacuzzi and more! Online Special savings! Welcome to Oakland #3, a lovely private 2 bedroom cabin for rent in Gatlinburg near the Glades Arts & Crafts Community with hot tub, fireplace, jacuzzi and more! Gatlinburg vacation rental in the Smoky Mountains next to the Glades Arts and Crafts Community of Gatlinburg. A 2 bedroom cabin that sleeps 4. Enjoy a Gatlinburg cabin with 3-bedrooms, a mountain view, pool, hot tub theater room, and a great location close to Gatlinburg, TN and the national park! Glades cabin rental in the Glades Arts and Crafts Community Gatlinburg TN. Book online for an immediate Online Cabin Special! 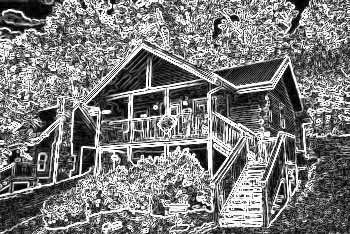 Oakland 1, a private 3 bedroom cabin in Gatlinburg next to the Glades Arts & Crafts Community with hot tub, jacuzzi, and a fireplace. Looking for a unique group cabin with game room near Gatlinburg? "Bar Mountain" offers guests a separate game house, a theater room, and bar area.